Ground flaxseed replaces eggs and adds fibre too in this tasty homemade pasta recipe. In a small bowl, stir together ground flax, water, salt and oil. Let stand for 10 minutes to thicken. Meanwhile, measure flour onto work surface or in large bowl and create a mound with a small indent in the centre. Pour flax mixture into flour and using a fork start stirring the flour into the flax mixture. Knead dough incorporating more flour if necessary, 1 Tbsp (15 mL) at a time until dough is soft but not sticky. Cover with plastic wrap and let rest for 20 minutes. Cut dough into 4 pieces. Knead each piece gently with flour if slightly sticky. Using pasta press, roll one piece at a time through first setting twice. Continue through settings until smooth, thin pasta piece is formed. Lay flat on floured surface; let dry for about 15 minutes. Continue with remaining dough. 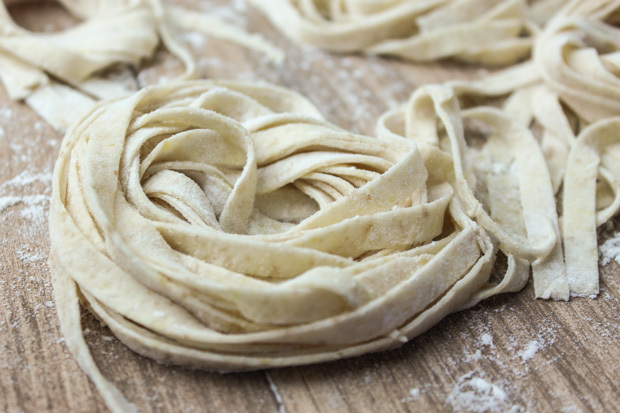 For noodles place pasta sheet through fettuccine cutter and toss gently with more flour; set aside. In a large pot of boiling salted water, cook noodles for about 3 minutes or until tender but still firm. Drain well and toss with your favorite sauce. *Tip: Pasta can be kept at room temperature for up to an hour, stored in refrigerator for up to 2 days or frozen for up to 2 months. Yield: 1 lb (500 g). Serving Size: 1/4 batch of noodles. Each serving contains 1 Tbsp (15 mL) ground flaxseed.